Our best selling fully solid 18k gold men's cross pendant necklace is now available in a large size. The men's cross measures 1 15/16" tall x 1 3/16" wide (with the hoop and bale, the cross pendant overall measurement is 2 3/8" tall). 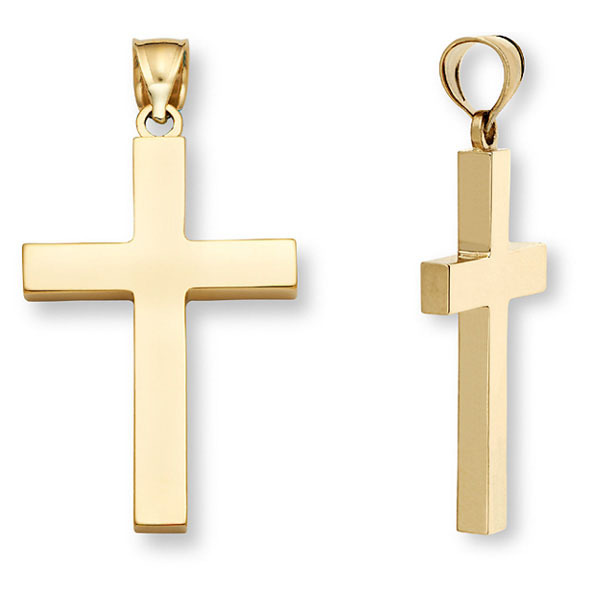 The 18k solid gold cross for men comes in two thickness levels: 2.5mm or upgrade to a 4mm thickness/depth to really create a substantial fully solid gold cross that will hold its strength through the generations! The cross pendant weighs approx. 18.0 grams in 2.5mm thickness and approx. 29.0 grams in 4mm thickness. The cross is also available in 14k or 22k solid gold (shown below) or various metals and colors as well as our standard men's size (shown below). We guarantee our 18K Fully Solid Gold Men's Large Cross Pendant to be high quality, authentic jewelry, as described above.